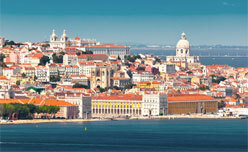 The Portuguese capital is growing in popularity for a variety of reason. A regular runner up for the title of the most popular city break destinations, Lisbon is also becoming a hotspot for self-employed professionals in a wide range of IT and internet-based businesses. A city with a great image, a mild climate, a thriving night-life and a growing offer of shared work-space facilities has also been known for affordability, especially when compared to other European capitals. The Underground Village, reclaimed from an industrial area of city is one of the many popular coworking spaces in Lisbon. The fame of Lisbon as a cheap destination, either for tourists or for expats may, however, soon become a thing of the past. While the Portuguese themselves have long been complaining about the increasing prices, the annual study of the cost of living for expats by Mercer, the world’s largest human resources consulting company, has confirmed that Lisbon is indeed more expensive also for the foreigners. The recently released ranking for 2018 has shown a drastic increase in the level of prices, which sends Lisbon from the 137th position achieved last year, 44 levels up, straight into the Top 100 of the world’s most expensive cities. 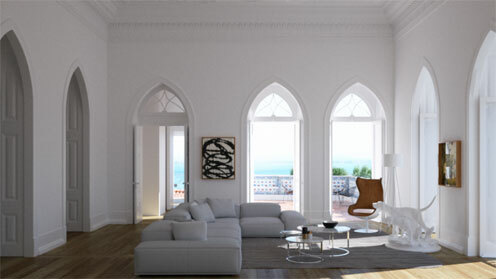 The elegance of the restored historical architecture of Lisbon proved irresistible to many international celebrities. The apartment above, located in the Alfama district belongs to the American actor, Michael Fassbender. Madonna, John Malkovich and Scarlett Johannsson are other famous Lisbon property owners. What contributed to placing Lisbon at the 93rd position? According to the study, the rapidly growing cost of housing, services and fuel in Lisbon, together with currency fluctuations have had the biggest impact. Lisbon real estate sector is booming, with prices for both buyers and renters doubling or even tripling in the most sought after, central Lisbon locations. A significant price increase can be felt also in Lisbon suburbs and anywhere along the coast in a manageable distances from Lisbon Airport. An idea of an inexpensive house by the ocean, a quiet sunny retreat close to an international airport, entertained by many northern Europeans, has never been less likely to materialize then now, as prices for even smallest houses or apartments close to the beach are reaching abstract levels. Those who would rather rent out while waiting for the real estate bubble to burst, have to be prepared to dish out anything from 1500 to 2500 euros a month for a basic 2 bedroom apartment in Lisbon city centre. Living further out AND far away from the Lisbon Coast is an option if you are on a budget. But only if your daily logistics do not require that you commute to Lisbon every day, as Portugal is one of the European countries with the highest prices for fuel. Expensive fuel means expensive public transportation (although in Lisbon it is only efficient in the very city centre anyway and you can hardly do without a car if you live in the suburbs) and a generalized increase of the prices of services. While expat in Lisbon can hardly avoid spending more money on basic commodities, tourist can resort to a few simple tricks to avoid the most inflated prices. While valid in most European destinations, the rule of avoiding holidays during the summer season makes especially a lot of sense in Lisbon. Portugal is blessed with a great, mild climate and if beach fun is not your main holiday aim, opt for visiting Lisbon during the shoulder season, in spring or autumn, You can count on plenty of sunshine in March and April and a warm ocean in September and October if you decide to try out the many excellent beaches in a 30 to 60 minutes drive distance form Lisbon. The prices of any tourist services (hotels, car hire, etc..) are considerably lower outside the summer season and queues to the most popular tourist attractions much shorter or none. Also, if you are on a city break in Lisbon, the 40 degrees heat pouring down from the skies is not you friend, if you have ambitious sightseeing plans. Although there is no shortage of hotels in Lisbon, in comparison with other European capitals, it is not as easy to find mid-range accommodation in terms of the price. Location sets the level of prices and pretty much any hotel in the city centre limits is expensive and especially families on holidays in Lisbon will often have to face a hard choice of very poor conditions vs. affordable price. Fortunately that gap in the market is quickly being filled by alternative forms of accommodation. Private rentals (for example through Airbnb or similar platforms) are plentiful and make much more sense economically than a hotel whenever more than two people are travelling together. Although modernity is slowly pushing out of the market the traditional penssão (meaning ‘pension’) boarding houses, a few can still be found, especially around downtown Lisbon – Baixa. Be transported a good few decades back and stay in Pensão Londres, Pensão Rossio ou Pensão Campo Grande and cut your accommodation expenses considerably. 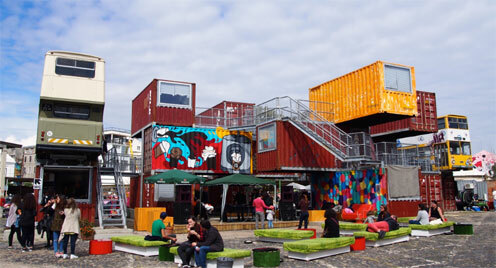 Finally, try out the modern, clean and very affordable Lisbon hostels for even bigger savings. Although this type of accommodation is traditionally associated with the backpacker culture, shared rooms and questionable sanitary conditions, Lisbon will surprise you with a really wide offer of hostels. Yes, in most cases you will still need to share the room with strangers (worth to note, each time more hostels provide family rooms and private rooms, where you do get more privacy) it is now perfectly reasonable to expect clean linen and sometimes also towels, en-suite bathrooms, pleasant lounge and breakfast areas and free wi-fi. Apart from being very affordable (on average around 20 eur/per night), hostels are a great place to meet an international crowd, make new friend and find inspiration for further travels. Portugal is famous for its fish and sea-food gastronomy and wine and your visit to Lisbon will not be complete unless you have tried typical dishes such as bacalhau à bras cod, grilled octopus salad or rice with duck an topped them with the famous custard pie, pastel de nata. As Mercer’s study clearly showed, eating out in Lisbon is not as cheap as it used to be. Especially in the most popular tourist areas, the restaurant bills have already given many unaware tourist indigestion. Pease note that what weighs heavily on the final cost of your meal in Lisbon is usually not the main dish, but the so called couvert – bread, butter, olives and a choice of cheeses, patés and cold cuts that will just be brought to the table and charged to your bill unless you specifically request for them to be taken away, as well as wine. Although Portugal has excellent and very affordable wine, when served in a restaurant it may turn out to be very expensive. A bottle of a mid-range wine to go with your dinner may often cost you three times more than in the supermarket. The way to go about steep restaurant prices without missing the opportunity to try the excellent Portuguese cuisine is to get off the beaten tourist tracks. Simply follow the Portuguese. Regardless of the social status, Portuguese love to eat out but a few can afford high end restaurant. Most neighbourhoods will have small, often family-run eateries the so called tascas, which serve very affordable meals. Although in the cheapest places the choice is often limited to a few dishes (usually meat and fish) the prices are hard to beat, the quality is great and the servings are generous. A useful tip: if you are only feeling nibbly or are ordering for a child, ask for meia-dose – half serving, at a reduced price. Often, for a fix price of 6-8 euros a menu consisting of soup, main course, desert and coffee is available. 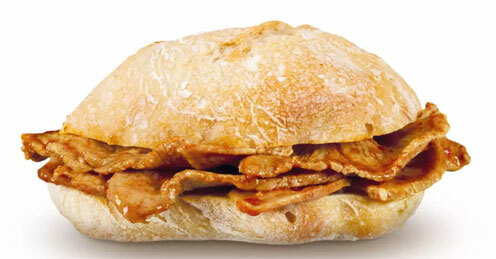 Bifana, one of the most popular on-the-go foods in Portugal. Although Portuguese celebrate their meals and spend long hours by the table, there is also a variety of savoury snacks than will keep you going for a long time for a very small money. Try cod-fish cakes (pastéis de bacalhau), shrimp turnovers (rissóis de camarão) or pork sandwiches (bifanas). If you are adventurous enough, snails in garlic and coriander and the Portuguese’s favourite snack in the summer season.